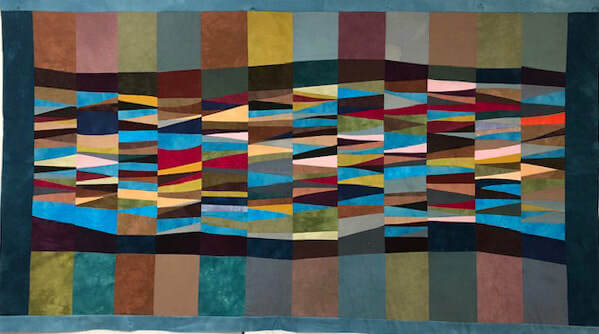 Students learn to assess the quilted quilt sandwich for completeness of composition and what considerations should be made prior to finishing the edge. Finally, students make take-home samples in which they have applied a Binding and a Facing worthy of praise from a judge. Students cut, piece, and press their way to success with the Venetian Tile pattern. 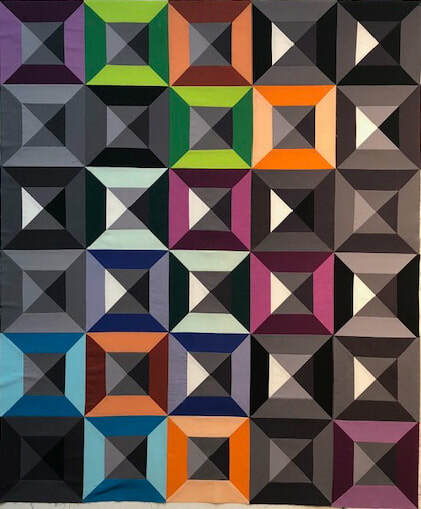 Once students learn the accurate cutting, piecing, and pressing techniques that are the foundation for award winning quilts, these skills can be put to use later in any block, sashing or border. 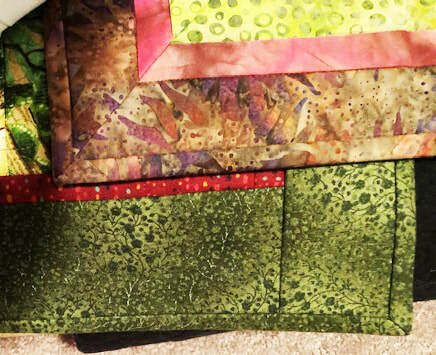 (three or six hour class) In addition to instruction in the basics of proper raw-edge fusible technique, this class covers the basics of color, value and scale-- essentials for good design work. This class is for students interested in Original Design, using the fusing method as a technique. Each student creates a unique landscape composition. This is not a machine applique class. 3. This dyeing class covers folding and clamping of the cloth to achieve pattern with multiple colors on each cloth. Efficient students will go home with examples of up to ten different fabric manipulations. In a three-hour class, students work with either home-made gelatin plates, or pre-purchased permanent Gelli-plates. Students have the choice of working with either paper and acrylic paints, or white fabric and fabric paints. Students use soft rubber brayers, artist type paint brushes, stencils, and stamps to create one of a kind images for use in collage and quilts. The mono-printing, marbling, and fabric dyeing classes require supplies to be pre-ordered prior to my arrival. I will prepare the order for you from ProChemical and Dye in Rhode Island as soon as the exact classes are selected. Then you may place the order at your leisure. I do not have any business relationship with them other than I have great confidence in their products and fair prices. Estimated supply fee per student is approximately $15. In this important workshop, students learn the difference between critique and criticism. Students learn how to think in objective terms about improving their own creative work, as well as how to start up and function in a critique group to foster mutual benefit from fellow artists and quilters. Whether the student works in traditional, contemporary, abstract, or art styles, the ability to assess design can mean the difference between ho-hum and WOW! Actual quilts are shown for thoughtful discussion. Negative commentary about one’s own work, or fellow students work is not allowed. Learn to see through a judge’s eyes! ​All Workshop fees are $650/ 6 hr. workshop, or $400/ 3 hr. workshop.